Sunday December 22nd 1901 Will and I were here alone. I was busy about the house all the forenoon and read in the afternoon and evening. a nice winter day. Monday December 23rd 1901 I baked bread and Dell helped me do a large washing by noon. In the afternoon I swept and dusted the house well. It was such a nice day. Tuesday December 24th 1901 I did part of the ironing this morning and had churning done. I was down to Mrs Fichlers and to the church with some things in the afternoon. We spent the evening reading at home. 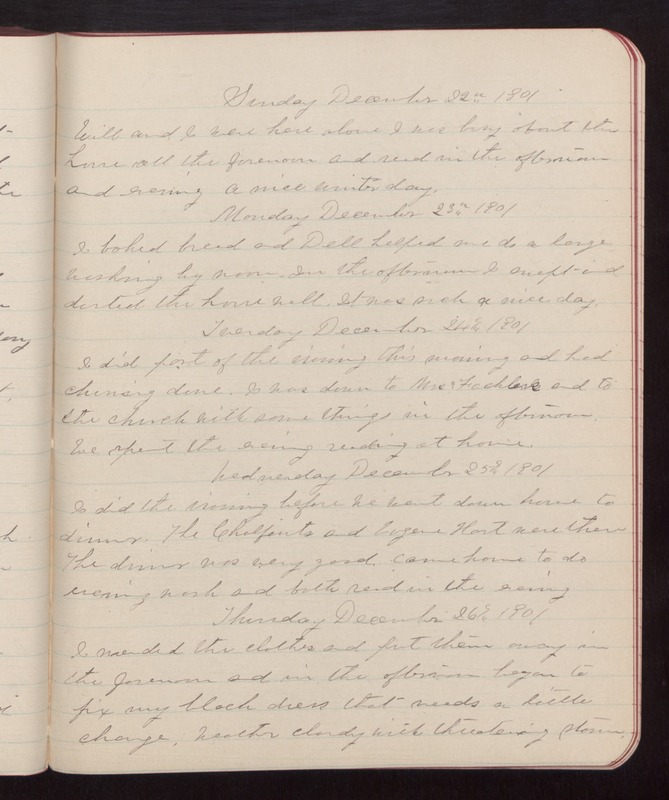 Wednesday December 25th 1901 I did the ironing before we went down home to dinner. The Chalfants and Eugene Hart were there. The dinner was very good. came home to do evening work and both read in the evening. Thursday December 26th 1901 I mended the clothes and put them away in the forenoon and in the afternoon began to fix my black dress that needed a little change. weather cloudy with threatening storm.